Dolphins in the middle of the desert? Yes! And there are seals too. 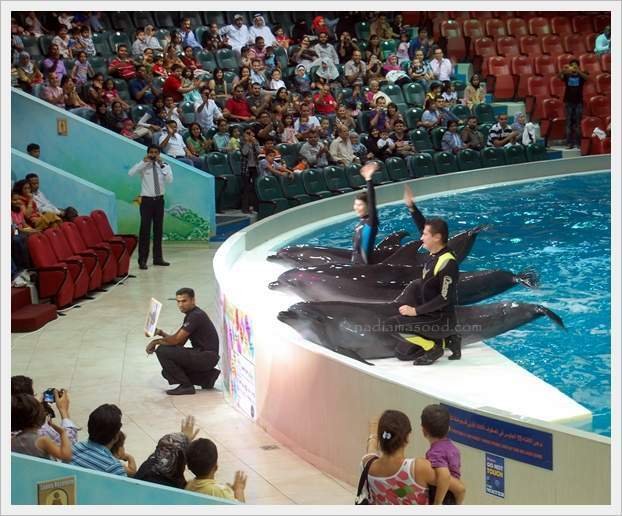 Inaugurated in May 2008, Dubai Dolphinarium is a modern marine mammal facility located in the Creek Park. 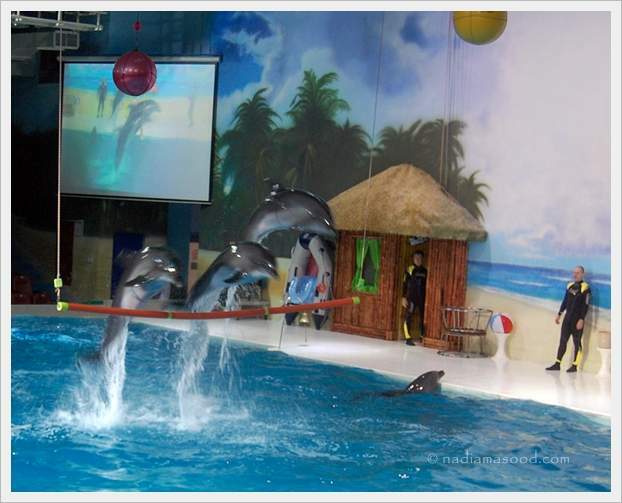 This is the Middle East’s first fully air conditioned indoor dolphinarium and has a 1,250 seat capacity. 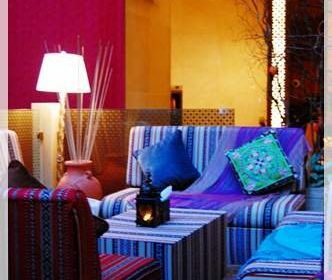 Even before this Dh33 million ($9 m) project opened to the public, the Dubai Municipality received numerous criticism from animal rights organizations. 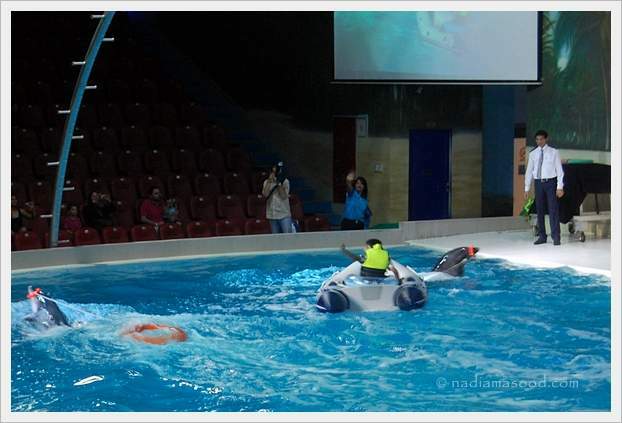 They questioned the source of its Black Sea bottleneck dolphins, claiming that one of them was not born in captivity but rescued from fishermen’s nets, and therefore should have been re-released. 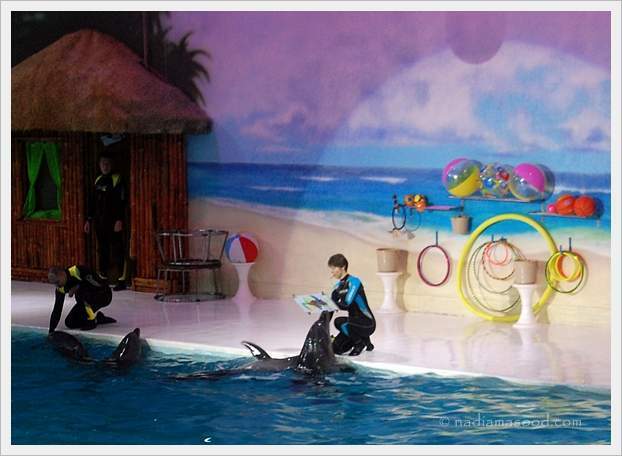 Besides the daily shows, Dubai Dolphinarium has special educational programs for schoolchildren and preschoolers. At the facility, kids learn about marine life and marine conservation through interactive lessons and classes. Summer camps and birthday parties are also organized. 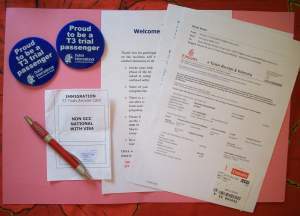 There’s also a therapy session for children with learning or physical disabilities. We arrive to watch the 6 pm show that runs for 40 minutes. 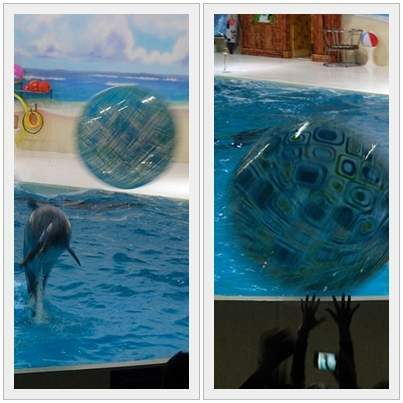 In the picture above, one of the dolphins brings a ball really close to the audience and then hits it with its tail, sending the ball flying to the cheering crowd. This interactive part of the show is really fun! Dolphins are trained based on the concept of positive reinforcement. This means that a dolphin is reinforced (rewarded) if it performs a desired behaviour correctly. He comes all the way from Paris to perform everyday at 6 pm for the entire month of October. We see him poke blades in a box that contains his assistant, retrieve three ladies from a tiny box that initially contains only one lady, frees himself from chains in the water, and several other tricks. 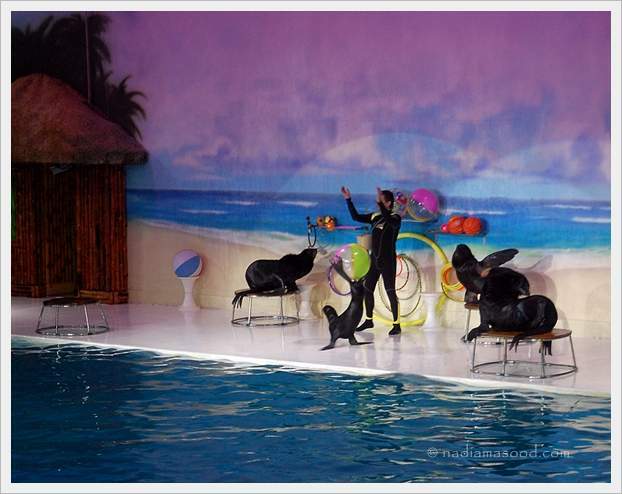 The seals perform amazing tricks as well. The smallest one is too cute! 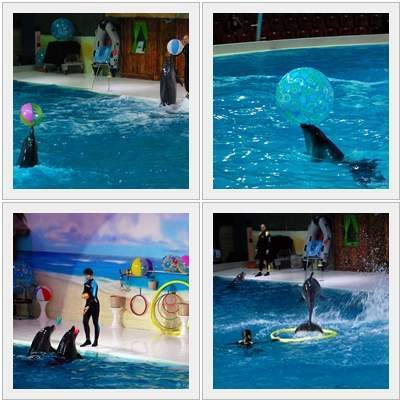 They walk with their trainer, dance with him, catch plastic rings, balance balls on their heads, and even sing! The dolphins are truly amazing creatures! They respond to their names immediately (unlike some of our kids). One of the dolphins takes colored markers in its beak and begins to paint. It’s just a random sketching of colors, really. 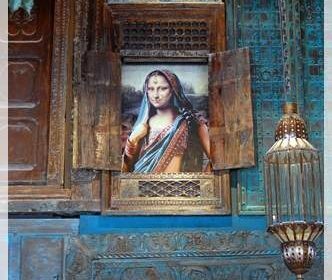 But it is immediately sold for Dh150 during an auction that’s held during the show. One very lucky young man wins a free ride! And he isn’t scared at all. In fact, he is all smiles. See, he’s even waving at the audience! One of the dolphins swims along tugging a buoy—so cute! I have a really great time. My entire family is there (well, almost) — my mom, MIL, Masood, his brother Mushtaq, and sisters Sophia, Sanaf, and Saima. My mom and Sanaf actually postponed their flight to Karachi to see this show with us. Thank you, ladies! 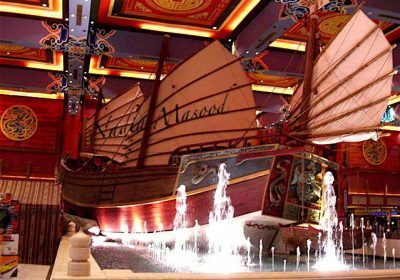 Masood says the show is better than the one he saw in Houston, and Sanaf says the show is better than the one she saw in Singapore. Tickets are priced at Dh100 plus Dh5 entrance free to the Creek Park. They also have a program called Swim with the Dolphins, which has received a lot of positive feedback and it popular among children. It is highly recommended by Phoebe. Atie recently posted..Remembering the moment when…. Oh, you’ll have fun too, inshaAllah, once you’re finished with your thesis. Weather’s starting to get better here in the UAE. Come on over when you can! wish I could fly to you this instance! just you wait for me, sis. I’ll be there one day, Insya-Allah. This sounds like fun, and something everyone in the family can enjoy. 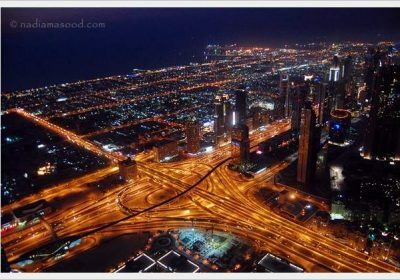 Dubai is indeed now a tourist magnet. Oh, how lucky of you to swim with the dolphins! Well, we can also have that opportunity here, but it costs a lot. The painting by the dolphin is basically just random strokes of yellow, blue, green, and red. A middle-aged man with a young boy bought the painting. Wish I could go here and watch the dolphins. Looks fun! And it’s cool that they let people know that the dolphins are third gen bred in captivity because there are some groups that are against dolphin shows. Well, I still feel a little bit concerned despite knowing the fact that these dolphins are bred in captivity and never knew the ocean, and I know these dolphins are well cared for, but a part of me still wish that these animals be freed. Then I think about how these dolphins are used to help educate children about marine conservation. These dolphins are also used as part of the therapy for mentally challenged children. So I guess there are pros and cons. Another same fun thing I did in turkey! Just shoot me now!!!!!!!!! 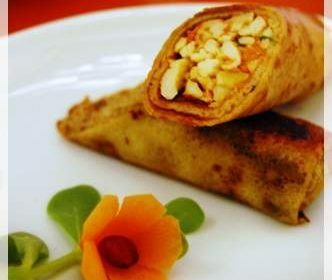 If only I were in Lahore right now! Where are the rest of the Turkey posts?! I would definitely want to ride that DOLPHIN!!!!!!!!!!!!!!!!!!!! Enjoyed a lot at Dubai Dolphinarium with my family. Thanks to the creator of this amazing show. And many thanks to the site who have suggested me to visit this place during my vacation trip.